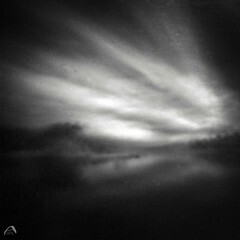 Have you ever tried zone plate setting on your pinhole camera? This is the very first zone plate image I try, in comparison to …. …. 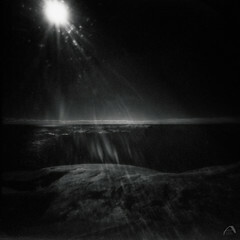 a regular pinhole setting of the same motive. 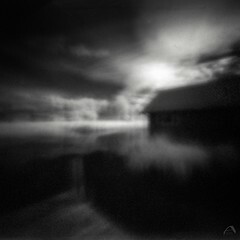 Over all, I’m very satisfied with the results from my new Zero Pinhole 612F multi format camera. Beautiful!!!! I had a look to the camera….It looks awfully difficult to manage it!!!! 🙂 I think it is fascinant….It allows you to develop your artistic sensitivity…. Wonderful! Both of them are magical. It’s interesting to see the different solutions, wow. I would love to have one of those zero cameras. ONDU cameras also seem to be interesting. Thank you! I’m glad you like them. Yes, I have read about Ondu, and it looks really interesting! I have not tried it though. But Jana at http://www.janaobscura.com has one, pop in to her site and have a look! I will! Thanks a lot, Marie! What a wonderful picture and I like how you showed how the changing one setting just slightly can alter the final picture so drastically. Thank you, I’m so glad you like it! The zone plate image is so whimsical! Yes, I agree! It will be very interesting to use it at it’s full potential when I have learned how it works. Looking forward to that. Thank you very much Grazie! I’m looking forward to use more of the zone plate setting, I’m very curious about it…. Fabulous Marie, I must try my zone plate again soon…and the 6×12 format is to die for! Yes, it is a wonderful dynamic format! And I’m really happy for the zone plate setting, must go out and do some more images with it.